Tye Sheridan wears black high top Converse “Chuck Taylor” All Stars in the film. Conrad and Grace are having their first love in All Summer Ends. 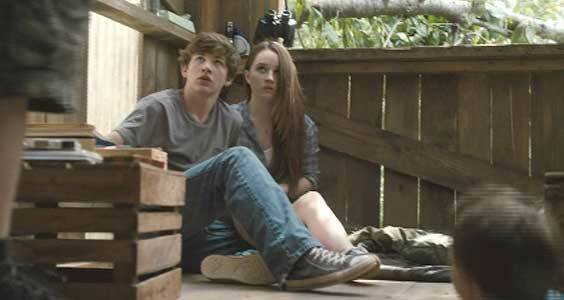 It’s summer, and for teenager Conrad Stevens (Tye Sheridan), things are looking quite promising. Grace Turner (Kaitlyn Dever), a girl whom he doesn’t know that well, out of the blue tells him that she thinks he could become her first love, and what does he think about that? Conrad is somewhat taken aback by this but soon male hormones kick in and he starts to see the positives of a relationship with Grace. This is especially true given his home situation. His father was a soldier killed in a war operation, and his mother now wants to live her life through Conrad, giving him very little space to do things on his own with his peers. He ends up spending a lot of his time wandering around the forested areas of his semi-rural town, or hanging out with his two best friends Hunter (Austin Abrams) and Tim (Ryan Lee) who share a tree house together and like to run around town pulling pranks. The difficulty of Tye’s situation is shown in several scenes on the Fourth of July. Conrad’s mom is expecting him to spend the day with her, while Grace has invited him over to her house to meet her family and have a barbeque. Grace’s older brother Eric and father tease her at the table causing her to run away to the front of the house. As Conrad goes to comfort her, Eric tells him to be aggressive. Then just as Conrad and Grace are starting to make out, Hunter and Tim pull up on their bikes and demand that Conrad go with them, as Tim has gotten the keys to his grandfather’s Suburban so they can go joyriding around town and create some havoc while most townspeople are watching the fireworks. Conrad bicycling with best buddies Hunter and Timmy. The story of the film is actually told in flashback, as adult Conrad (Pablo Schreiber) is watching his son starting to experience a feeler from a girl for the first time. But Conrad’s story is a lot more complicated and tragic compared to the simple “want to hang out” request of a young girl stopping by their house to see if Conrad’s son wants to go out on a walk with her. Back in time on the fourth of July, Conrad, Hunter, and Timmy are driving around vandalizing people’s lawn ornaments, knocking over mailboxes, and when they get to Grace’s house, Conrad steals a large potted plant on the front porch. Unfortunately for them, they are spotted by Eric, who hadn’t gone to see the fireworks. Angered by what the boys did, he decides to follow them in his sports car, leading to a chase through the countryside and onto small access roads in the forest preserve. A deer is standing on the road, right in the way. Timmy is able to swerve away but not Eric, who hits the deer head on and is fatally injured in the accident. The boys are shocked by what happened but differ about what to do. Timmy is very distraught and crying, Conrad wants to call the authorities for help, but Hunter overrides that idea and says that the only thing to do is get out of there so that they are not implicated in the accident. Conrad is invited to dinner at Grace’s home. With this set up, the story takes on two double-edged facets. One is a morality play: will the boys end up doing the right thing. The other is the burgeoning romance between Grace and Conrad, which she uses as an escape from the grief she feels, while Conrad goes along not knowing how to react given that he is responsible for both the love and the grief Grace feels. Their romance continues to intensify as the guilt builds up inside Conrad. At the same time, a serious rift has developed between Hunter and Conrad, leading to physical blows at times. These facets play out over the summer and in the town as inevitably they collide. Is it an ill-fated romance or will young love conquer all? Will the truth set them free or will it make them even more miserable? These are the issues that make up the balance of the film. Grace and Conrad decide to go all the way in their relationship. All Summers End is a thought provoking film, and although it has the elements of a summer romance, is set within a world of realism rather than fairy tale. Both the main characters learn important life lessons in the film, and their story is not what you would expect in a typical teen romance film. All Summers End doesn’t have super heroes with special powers living in a fantasy world. Instead writer/director Kyle Willows has given us interesting messages and situations, but how does a film like this get to the teen audience that should see it? It didn’t have a wide release, and doesn’t even have an MPAA rating. This could be a good thing, as it would probably receive an R, even though there are no totally explicit scenes. The industry rating system doesn’t know how to handle films like this. If a film shows a loving relationship with any explicit scenes, it gets an R, but films with a lot of graphic violence and killing end up PG-13. Go figure. All Summers End should definitely be a PG-13 as there aren’t any explicit scenes, even though they do go all the way in their relationship. The film is well cast, and the lead actors give authentic performances. 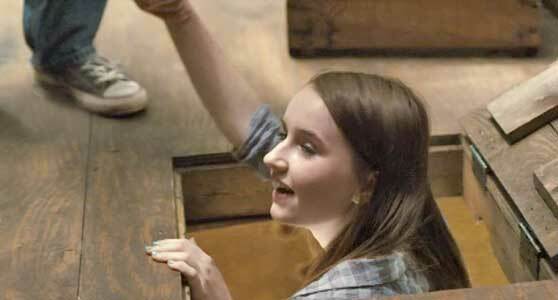 Kaitlyn Dever is terrific as the young teen determined to enter the world of adulthood by choosing Conrad as her lover and making things happen on her terms. In the end she discovers the old adage “be careful for what you wish for” applies to her. Tye Sheridan is also very good as the kick back Conrad who learns that being proactive and truthful does not always result in a happy ending. It’s not a perfect film, but it makes you think, the perfect antidote for franchise action/adventure movies with loud effects tracks. Conrad has a lot to think about regarding the direction of his life. Hunter discovers Conrad and Grace in the tree house. Tye Sheridan, who plays Conrad, wears black high top chucks throughout the film. Just like Conrad is a bit off from a regular teen, his chucks are slightly different, with red racing stripes instead of the usual black. The best chucks scene is when Conrad brings Grace to the tree house to make out but they are discovered there by Hunter and Timmy. Conrad helps Grace to climb inside the tree house. All Summers End. (2017) Tye Sheridan, Ryan Lee, Austin Abrams, Kaitlyn Dever, Beau Mirchoff, Pablo Schreiber. Written and directed by Kyle Wilamowski.